Team Flash confronts one of the creepiest villains in the series so far, which sets in motion a reconciliation between Iris and Nora. Our review of “All Doll’d Up”! 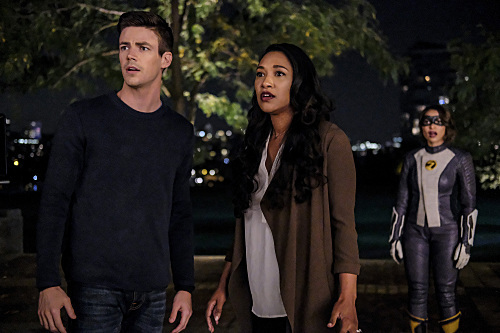 This week’s The Flash begins with Iris and Barry dealing with the aftermath of Nora’s reveal that Future Iris repressed her daughter’s powers. Since Nora has moved out of the loft, she hasn’t been in communication with her parents or even reporting for training sessions. As Barry tries to encourage Iris, they get an alert that the art museum is being robbed… at 10am. Bold as brass! Unexpectedly, Nora/XS does show up in the field and acts impetuously, almost getting some folks hurt in the process. Nora even does on to cut off radio communication Iris as her mom tries to offer direction and follows it up by talking back to Iris when they get back to Star Lab… yikes. “I wish you would try to understand who your mom is today…” Real talk from Barry because I really don’t think we can hold Present Iris responsible for what Future Iris has done. In any event, this episode features one of the series’ most creepy villains, Ragdoll… who can bend, break, and contort his body in order to break into the various spaces and steal. I was legit traumatized. After Ragdoll breaks into a private home to steal jewels from a couple, the next day Barry (in his CSI capacity) and Iris (as a journalist) are both on the scene. 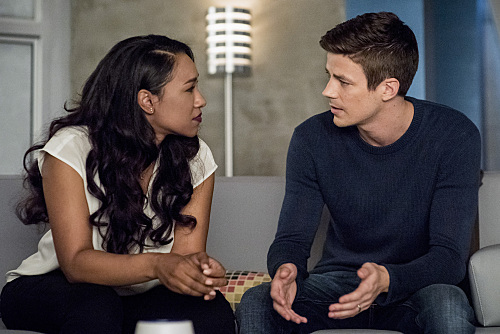 In order to help cheer Iris up, Barry suggests teaming up to solve the case. Later, Ragdoll strikes again at Seaver Architects and takes down a whole building! This time Barry does see his creepy face. UGH. After running some tests on hair from the various crime scenes, they learn that Ragdoll is really Peter Merkel, son of billionaire business mogul, Theresa Merkel. Barry suggests he and Iris go undercover that night to attend an event Theresa Merkel is hosting and maybe gather some information. I love that we get a West-Allen date night out of this because Barry in a tux… IRIS IN THAT RED DRESS WITH THE SLOW WALK… this is the quality content we deserve. Theresa Merkel has excellent deductive skills, because as soon as Barry and Iris appraoch her, she knows who they are and why they’re there. And apparently, Ms. Merkel has also washed her hands of Peter. Unfortunately, this encounter and repeated reminders of difficult relationships between mothers and their children triggers Iris’s sadness. All she wants is a chance to get to know her daughter! While Barry and Iris share a dance, Ragdoll slides into the background and recognizes the West-Allens, too. Meanwhile, Cisco is back and teaming up with Sherloque, Ralph, and Caitlin! They haven’t had any luck finding Cicada, but Cisco feels confident he can help with locating Caitlin’s dad. Cisco vibes and sees equations on a chalkboard… at Hudson University. Apparently Caitlin’s dad knew Professor Stein. Hmmm… but more concerning is that Cisco using his powers is causing him pain in his hands. And Cisco is hiding that from the team. When Cisco vibes again at Professor Stein’s old office, he’s able to see the equation Caitlin’s dad is working on, an equation for ice? KHIONE, the goddess of snow. Could it be that Thomas actually *creates* Killer Frost??? Nora definitely needs to bring it on down. In exchange for Nora’s help, Cecile agrees to tell her stories about Barry growing up. Nora soaks up alllllllllllll the information. However, Cecile, being the awesome person she is, has really been telling stories about Iris growing up, just replacing with Barry’s name. Ultimately, Cecile’s point is that Nora should get to know her mother as she is now. And I couldn’t agree more. The episode takes a turn when Ragdoll commits a home invasion and kidnaps Barry (not The Flash!). Since Sherloque has broken the extrapolator, it looks like the team has to depend on Ralph. We get an awesome scene of Iris piggy-back riding Ralph as he bounces through the city. In the confrontation with Ragdoll, we learn that he was created on the night of the Enlightenment, crushed by a piece of the satellite. “Suffering can’t be stopped,” says Ragdoll, and he pushes Barry off the roof. And Iris, like the ride-or-die badass she is, runs and leaps right off the building to save her man, NO HESITATION. Iris able to remove the handcuffs around Barry and he catches her and runs down the building. Nora (after receiving a call from Caitlin) arrives in time to see Iris save Barry. And Nora is just as wowed as we are! In the meantime, Ralph has captured Ragdoll. “I want you to live your life and I want you to be a part of mine… no secrets, just us being who we are today.” YES!! !